Celebrated interior designer Alex Papachristidis has a passion for beauty. 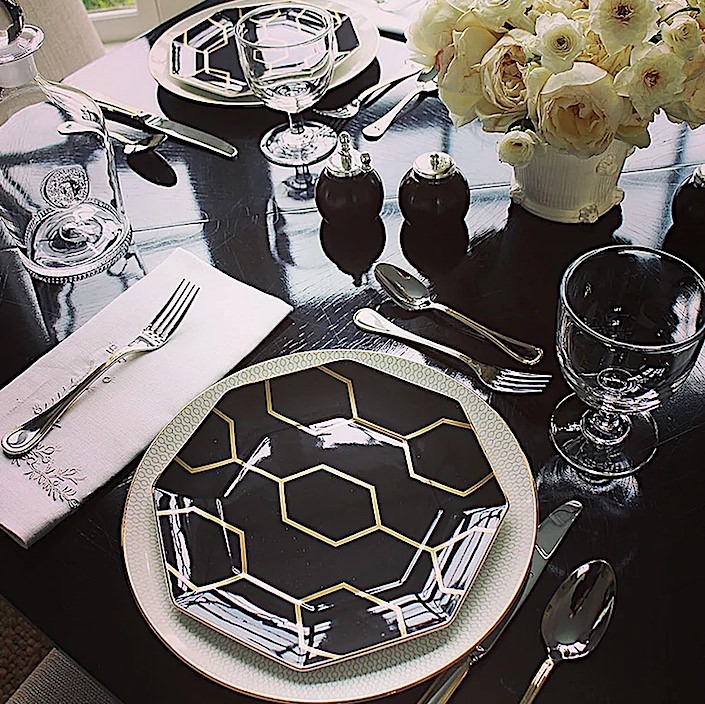 Known for his timeless elegance and inventive creativity, his love for and knowledge of the decorative arts extends to all aspects of his life including setting the table! A fervent collector and avid traveler, his tabletops exude a personal, colorful and exuberant style. 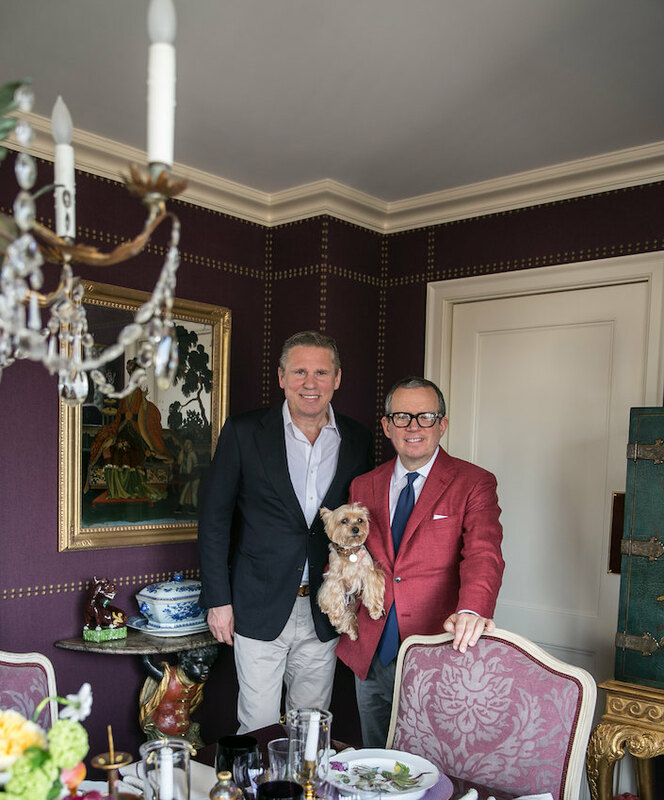 Tag along with me and Susanna Salk as we visit Alex in his glamorous New York City apartment to learn his tips for entertaining, how the table tells a story and why purple is the new neutral! Alex’s extensive collections aren’t just for show. He believes in using what you love and own rather than relegating the “good stuff” to the depths of the cabinet. And with a warm and welcoming hospitality, his tabletops are an expression of both his passion for design as well as his close friends and family. the bold tailored drama of Dinner at the Game Table, or more, you’ll be able to bring home Alex’s signature style for your own! 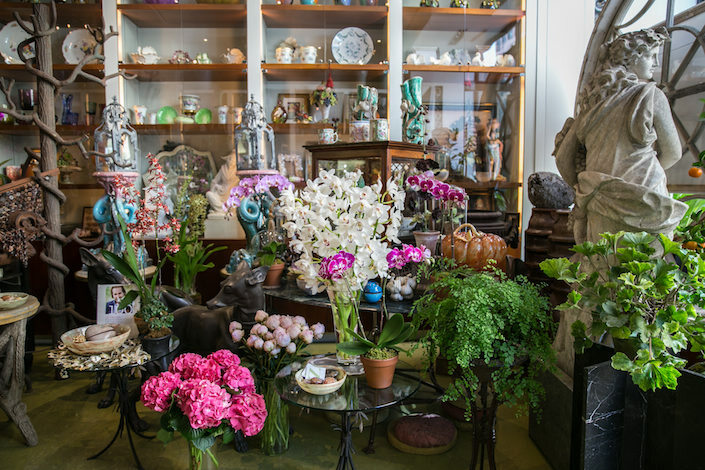 And a big thank you to Zezé for his magnificent floral centerpiece.His shop is an explosion of floral temptation. (And be sure to check out Christopher Spitzmiller‘s amazing gilded faux bois container). But mostly, thank you Alex for your exuberance and talent and to Scott and Teddy for their endless hospitality! For more of Alex’s lifestyle, join us for a visit to his home in the Hamptons. 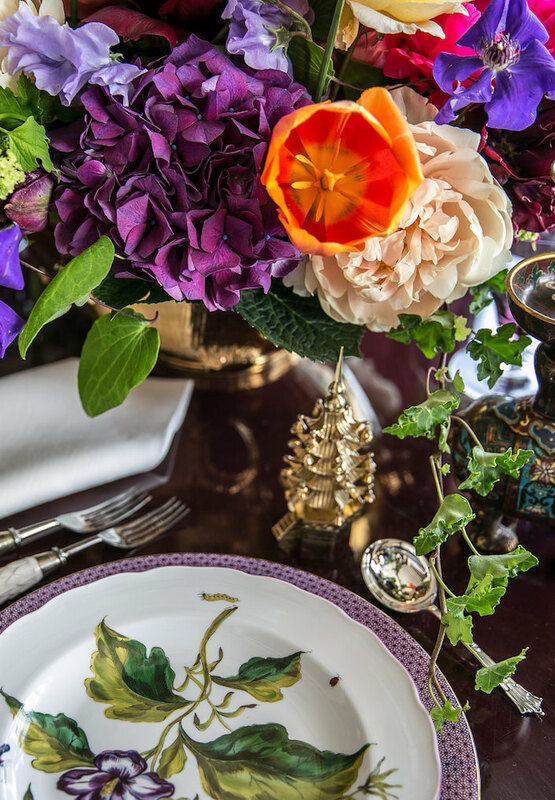 We can’t wait to add a touch of purple to our tables and shop Everyday Elegance! 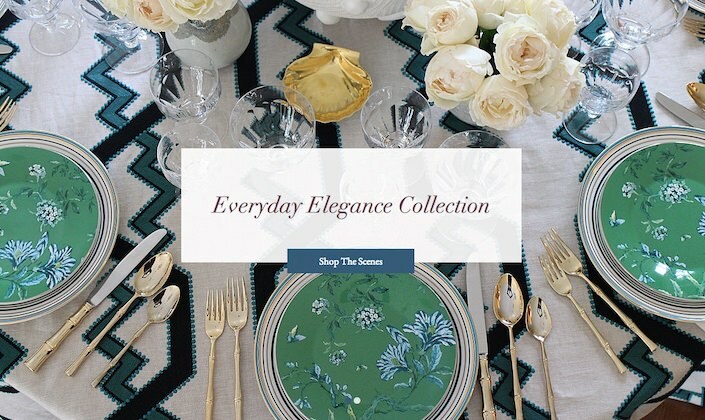 This entry posted in interior design, Quintessence video series, Stylish Shopping. 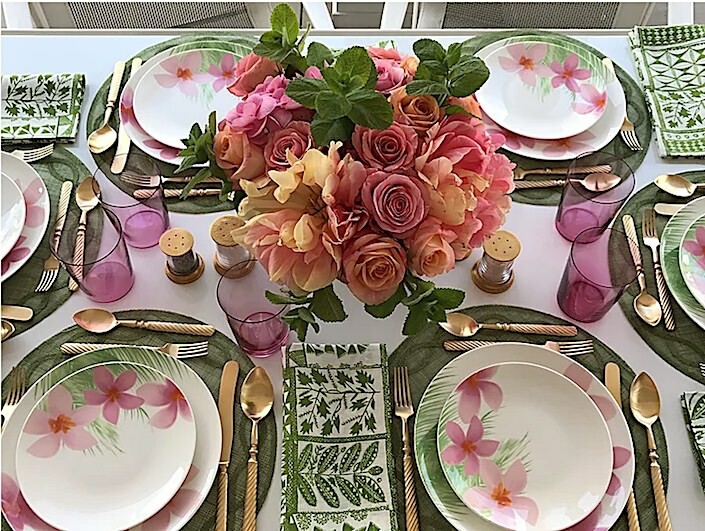 Entry Tags: Alex Papachristidis, interior design video, setting the table, Video, Zeze flowers Bookmark the permalink. I agree with him 100%! If stuff isn’t pretty enough for company, it isn’t pretty enough for everyday either. Alex’s table is exquisite! From the flowers to every detail he uses. He makes it look so easy. This was fun to watch. I’d love to be a guest at his table. Thank you! You can see it online via One Kings Lane and I think ElleDecor. And Alex has his own book as well and I believe its in there too! I know with Alex that behind the scenes he is fastidious about every detail being perfection but what is truly wonderful is that when you actually sit down to dine at one of his wonderful settings he is the most relaxed hosts ever. From the decor to the food to the guests its all seamless and relaxed. Perhaps its why Laura and I always have a standing reservation at his dinners. Love the setup! Amazing decorations! Alex is in very good company with his use of purple as a neutral. Claude Monet declared it the color of the atmosphere and the color of fresh air. Even with all the highly ornamental details, Alex’s table and your video presentation are a breath of fresh air, thank you ! Loved this video! You are so easy to watch! Some many great tips. Loved this video! I agree with all the previous comments (except that I don’t have a standing reservation😬), and can only add that I love the idea of using the dining table as a reading table when not in use. 85 queries in 0.618 seconds.